It is with regret that I’m announcing my retirement from Gower Serenity. I’ve reached a certain age! 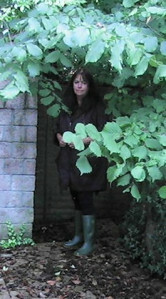 I’m loving writing my books (www.intheplottingshed.com) so I’m making the transition to being a full-time writer. Thank you to each and every client who’s shared their lives with me. I hope that you have benefitted from Nature’s bounty through the medium of the wonderful herbs and essential oils we have shared together. May love and light go with you in your next adventures. I’m delighted to welcome Thorne Moore, author of Shadows, to Linda’s Book Bag today. I adore the atmospheric cover of Shadows and although I haven’t had time to read it yet, I was so pleased when Thorne agreed to come on the blog and tell me a bit about it. Shadows was published on 14th June 2017 by Endeavour Press and is available for purchase in e-book here. In her struggle to cope with her unwelcome gift, she has frozen people out of her life. Her marriage is on the rocks, her career is in chaos and she urgently needs to get a grip. Okay, I admit it, I lost my way. Big time. Blame the menopause but mostly blame LIFE! I’ve been busy writing novels. This entails sitting at my desk for days at a time, nights too if the muse allows. Wonderful exercise for the brain, not so good for the body. Embarrassing symptoms lead me to take Ovestin – the oestrogen cream for ‘down below’. It worked for a time but then I started to experience severe heart burn. My digestion has always been crap but controllable with my beloved herbs. Distracted by book sales, promotions and creation, I ignored it and eventually succumbed during an intensely busy personal phase, to taking Oesomeprazole. It worked. Such a relief! I could eat what I liked, drink what I liked and forget about digestion. Not a problem. So I did just that during the next six to nine months, while a relative needed nursing, a book needed finishing to a deadline and I got involved in an exciting personal project with my dear spouse in France. Life was full on and I was full too, stuffed with bread, wine, cheese, chocolate – to fuel the vast energy stores needed to juggle all the plates. And I grew. Not in a deeply spiritual way – I just grew. About a stone and a half, most of it around the belly. Then, a pause in the hectic schedule broke through. A new dawn. As part of my CPD programme (continuing professional development that all herbalists must do to retain their practising license) I attended a Seminar run by NIMH (National Institute of Medical Herbalists) on PPI’s (Protein Pump Inhibitors) – the generic name for Oesomeprazole and her sisters Lanzaprazole, Omeprazole etc. This drug is dished out to millions of people worldwide for indigestion and heartburn issues and, let’s not forget, it works. What I learned under the tutelage of Richard Adams, a fellow of NIMH, was a revelation. Protein Pumps exist in every cell. In the stomach they produce hydrochloric acid to disinfect our food and kill off any bugs. We need an acid stomach. What Richard suggested was that far from less acid production, we actually need more. PPI’s reduce acid production by 90%. They do indeed inhibit these protein pumps, and their host cells then die off. What I didn’t know was that protein pumps exist in all cells of the body. No wonder I was so tired and every time I looked in the mirror I looked older. (In fact, what really freaked me out was I saw my mother, an alcoholic who suffered from dementia – not a good look – looking back at me. The edges of my face had blurred, losing definition; my skin was dry, growing wrinkles at an alarming rate and keeping me awake at night because it was so itchy.) What I’d been experiencing was cell death and my body was working overtime to produce new, replacement cells. Exhausting. I also learned that PPI’s have undergone extensive research, mostly in the States by the medical profession, and are linked to a 20% increase in MI’s (myocardial infarction or heart attack), sclerotic arteries leading to dementia (my personal nightmare scenario), joint pain and possibly even cancer. Quite motivating. The regime I’m now following is working, and it’s been less than a week. Although I was only taking half a 20mg tablet of Oesomeprazole every day, I felt lousy. Since the seminar on Saturday, I’ve taken none. I’ve added calendula tincture to my herbal formula of milk thistle, withania, camomile, rosemary, red clover, turmeric, sarsaparilla, nettle, agnus castus vitex, leonorus, hawthorn and verbena. Before bedtime I take a heaped teaspoon of slippery elm in water to heal my sore oesophagus. Before each meal I chew 2 deglycyrrhized (to avoid a raise in BP) lozenges of liquorice enzyme. I also am using “Wellsprings Serenity” Cream 20-1 transdermal progesterone/oestrogen cream day and night. On top of that natural medicine I have changed my diet to a Paleo one. No carbs, lots of vegetables, natural oils and grass-fed meat, free range eggs. This new approach has been transformational. I woke up this morning with tons more energy, happy mood (I’ve been very, very grumpy), a clear head, no heartburn, no joint swelling as before, and already I’ve lost 5 lbs in weight. My stomach is flatter (some way to go, it has to be said) and my breasts have reduced in size and tenderness. My libido is clawing its way back and my husband’s smile has returned. Drugs have their place and I wouldn’t want to be in a world without them but they are strong stuff and should be kept in reserve for those times when they are life saving. Food, herbs and a natural approach really do work better. I wish I hadn’t wasted time and energy forgetting that. Fascinating interview between two gifted writers,both adept at excavating the human, flawed, psyche.